MOSCOW (AP) --- Russian President Vladimir Putin will demand the return of two diplomatic compounds seized by the United States when he meets in Germany this week with President Trump for the first time, the Kremlin said, as a senior Russian official warned that Moscow’s patience on the issue was running out. There has been intense speculation for months over when the two presidents might come face to face. Since confirming the meeting last week, the White House has been light on details about what they will discuss. McMaster said administration officials had been tasked with drawing up options to confront Russia over “destabilizing behavior,” including cyberthreats and political subversion, as well looking for ways to cooperate on issues such as Syria and North Korea. On Syria the two have clashed, and last month a U.S. fighter shot down a warplane belonging to Russia’s ally President Bashar al-Assad. 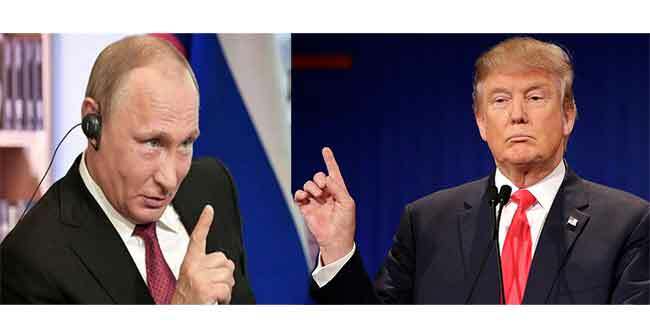 The White House has said sanctions will not be lifted on Russia until it withdraws from Crimea, and in the Senate both parties are drawing up more sanctions to punish Russia for its alleged election meddling.